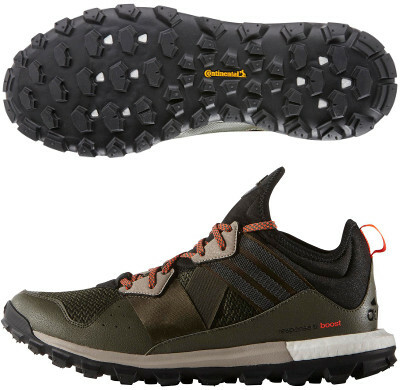 Adidas Response TR Boost are neutral trail running shoes. The Adidas Response TR Boost is the new name of the trail running shoe which was supposed to be Response Trail 22. It is not only that Boost™ is present in the midsole but also a complete redesign leaded by sock constructed upper. Lot of cushioning and comfortable fit make the Response TR Boost a versatile shoe which performs best on dirt roads. Upper from Response TR Boost is definitely different from what is currently available in the market and it gets inspiration from first mountain/trail specific shoes released some decades ago. Upper is composed of one piece boot (tongue integrated) with seat belt overlays for improved support. Oversized midsole combines already mentioned Boost™ foam (not full length but decoupled) for more reactive cushioning with traditional EVA. Outsole has been engineered in partnership with tyre manufacturer Continental™ and its heavily lugged (8 mm depth each) design has been inspired by mountain bike tyres for optimal traction and grip on dirt paths.